Grapes to Wine: Where do the Stems Go? So I’ve enjoyed several parts of the grape plant. Grapes, of course, and even the occasional grape leaf (as a food, not a clothing item, silly), but I’ve never had any interest in the grape stems. Anyone who has seen the big bins of grapes as they come in from the vineyard knows that these stems are part of every bunch of grapes. That made me curious. Where do the stems go? One of the nice things about living in wine country is that we have enjoyed quite a few tours of wine making facilities. Each winery has a unique approach to the process, including their own particular choice in equipment, but the underlying steps in the process are the same. This includes the destemming process. Those bins full of grapes from the vineyard contain more than just grapes. A quick glance will show you stems, leaves, stones and even the random critter that wasn’t fast enough to get off the grape bunch as it was being picked. Hand sorting and cleaning is certainly an option, but that approach doesn’t scale well, beyond the home wine maker stage. Machinery is required! There are several popular machines used in the destemming process. A popular device combines destemming and crushing, so it is counter-chronologically named a “crusher/destemmer” although the destemming should probably get top billing. 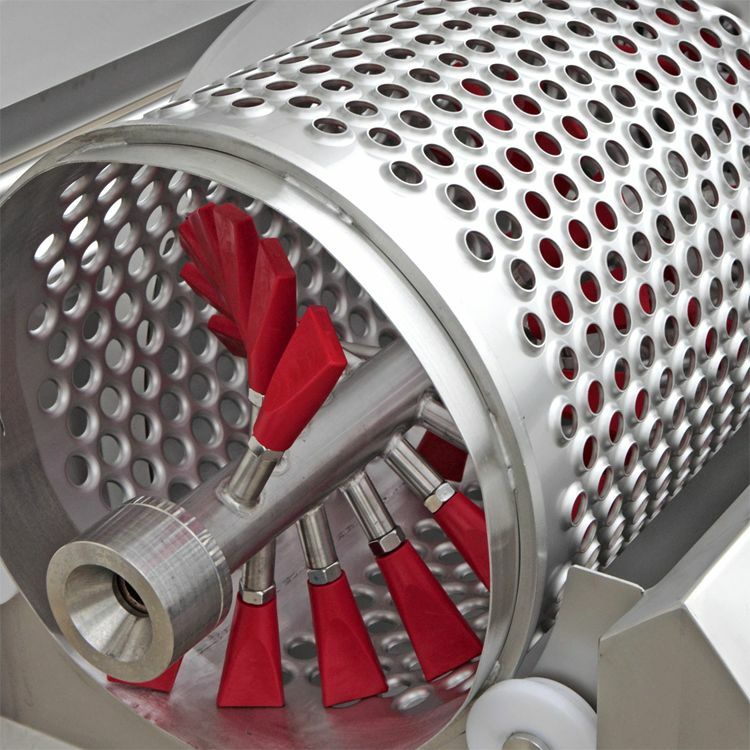 This machine is basically a giant auger (think large screw) that smooshes (to use a technical term) the grape bunches along a stainless steel valley, squeezing out the grape juice while pushing the other bits to the end of the device where they can be removed. One popular alternative to the auger destemmer is a device that uses paddles or prongs to gently (?) knock the grapes off of their stems. These paddles rotate within a cylinder with grape-sized holes along its length. Some crushing does inevitably occur, so the runoff juice is collected, as with the auger-style machine. 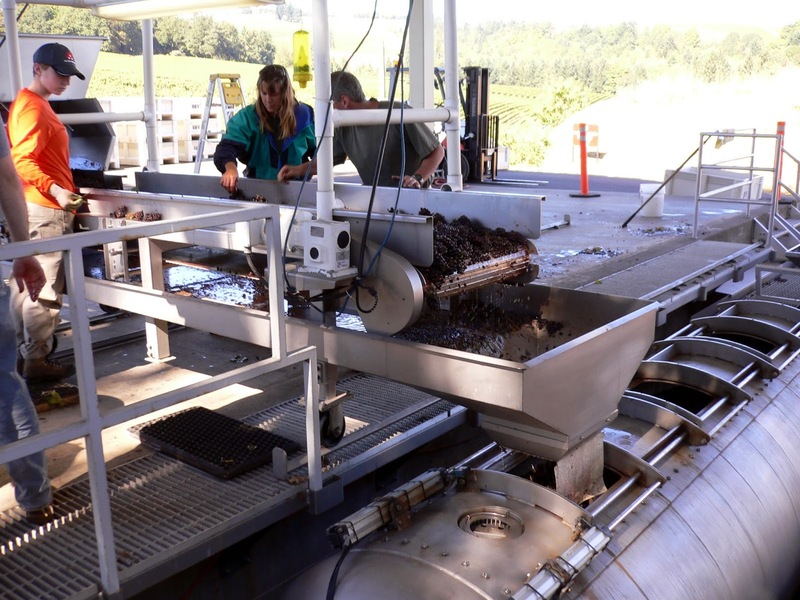 Using either of these machines allows the wine maker to separate most, but not all, of the non-grape material from the grapes. Once this is done, the grapes are ready for the next step, the crush or pressing operation. But that’s a topic for another day. Good luck with the harvest, wine makers everywhere!